No matter what leadership arena a person serves in-whether leading a family, a church, a civic organization, a company-adopting the leadership example of Jesus will make that person more effective and productive. Leadership is influence, and no leader has had greater influence on the world than Jesus Christ. The lessons of His leadership style are practical, learnable skills that anyone can apply today. Michael Youssef, who has executive experience in worldwide ministries, has examined the leadership Jesus modeled and suggests Christlike qualities every leader needs. But he doesn't stop there. With Jesus as the standard, Dr. Youssef considers how to deal with the temptations and pressures leaders face, including ego, anger, loneliness, criticism, the use of power, and passing the torch to others. Men and women in search of excellence in developing their leadership abilities will find much to aid their quest in this close-up look at Jesus-the greatest leader who ever lived. 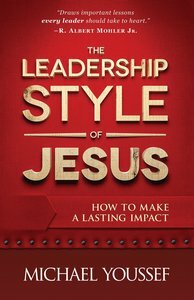 About "The Leadership Style of Jesus"